Traditional showers take up a fifth more floor space than modern frameless glass designs. Molded plastic trays and panels are also prone to yellowing. As a result, more homeowners in Toronto now invest in superior frameless glass shower enclosures. What is a Frameless Glass Shower Enclosure? Frameless glass shower doors and panels represent the fastest growing trend in modern bathroom designs. Unlike pre-fabricated plastic and metal, frameless glass retains an ultra-modern look for longer. Elimination of cumbersome framing also means showers are easier to clean and take up far less floor space. As a result, a frameless glass shower installation can add value and superior functionality to a bathroom. 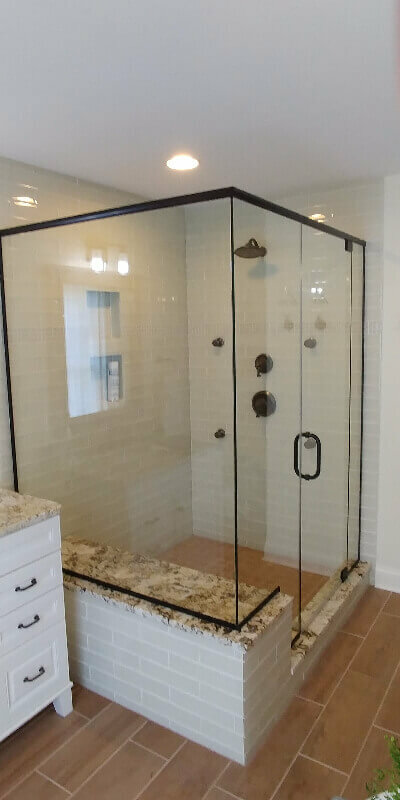 In non-frameless glass showers, large trays, doors, and side panels are secured by heavy metal framing. Joins and seams are then waterproofed using caulk which can quickly degrade and allow mildew to take hold. Thankfully, frameless glass represents an entirely new design paradigm. By using quarter-inch thick frameless glass, shower footprints are visibly reduced. However, enclosures aren’t just space saving. As well as well as being tempered for durability, frameless glass allows more light to diffuse in bathing areas. The results are beautiful shower and bathtub designs, which retain a modern feel without requiring heavy maintenance. Frameless glass makes more possible in even small size bathrooms. Neo-angle and corner showers are both stylish and space-saving. Meanwhile, full-width and rectangular showers represent the epitome of bathing luxury. Frameless glass tempered for durability is prized by home designers. The material lends itself to a wide variety of design concepts. As a result, walk-in luxury showers can be tailored to the exact dimensions of almost any bathroom. Tempered glass is the only modern bathroom material which is effectively mildew proof. Sliding doors and panels can be wiped down easily. More importantly, brass and stainless steel components never dull or rust as time progresses. Can a frameless glass shower add value? Home buying trends in Toronto, show a strong preference for bathrooms which feature frameless glass. At the same time, enclosures are safer and more functional than traditional showers and bathtubs. Walk-in frameless showers do not necessitate stepping over cumbersome bath rails. Homeowners, therefore, prize frameless glass for its aesthetic and functional superiority. What Types of Frameless Glass Showers are There? A frameless glass shower enclosure can be precisely tailored to almost any personal design preference. Showers can be full-width and feature sliding or hinged entrances. Glass itself can also be frosted or patterned for privacy. Corner and neo-angle showers, meanwhile, can be tailored to the exact dimensions of any bathroom. 808 Glass are go-to frameless glass experts in Toronto for homeowners and property developers. All glass supplied by us is expertly tempered for maximum durability and resistance. Always focused on luxury, we offer a wide variety of different frameless shower enclosure and door designs. More importantly, we help homeowners realize what might be possible by providing full on-site consultations. 808 Glass is long-lasting and retains an iconic look long after installation. Perfect for bathroom remodels, we also allow homeowners to choose from an extensive range of accompanying hinge, door handle and drop down seating designs. With every install, 808 Glass offers a comprehensive 5-year warranty on all parts and labor. Are you ready to add a touch of luxury to your bathroom? If so, make sure to reach out to us to schedule a free, no-obligation consultation.